Moynalvey’s short trip to neighbours Summerhill on Sunday afternoon resulted in their fourth loss from five outings in the Div. 1 A League to date. Dunshaughlin maintained their unbeaten start to the A league while condemning Moynalvey to their third defeat in this Div.1 game played at Kilmore Park Moynalvey on Sunday afternoon 24th February. An under strength Moynalvey lost out heavily to Navan O'Mahonys in Round 2 of the A League at Brews Hill on Friday Night 1st February. Moynalvey and Syddan got their 2019 A league campaigns off to a start by sharing the spoils at Kilmore Park Moynalvey on Sunday morning 27th January. 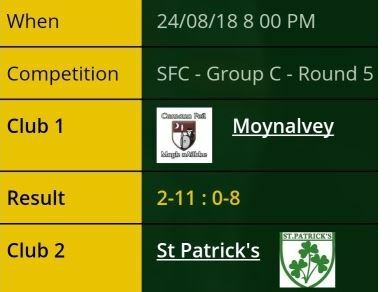 The result of this Fairyhouse Steel Senior Football Championship Final Round Group C game between Moynalvey and St. Patricks played at Ashbourne on Friday Night 24th August ensures safety for Moynalvey while St. Pats go into the relegation playoff.